A friend recently had a baby girl. 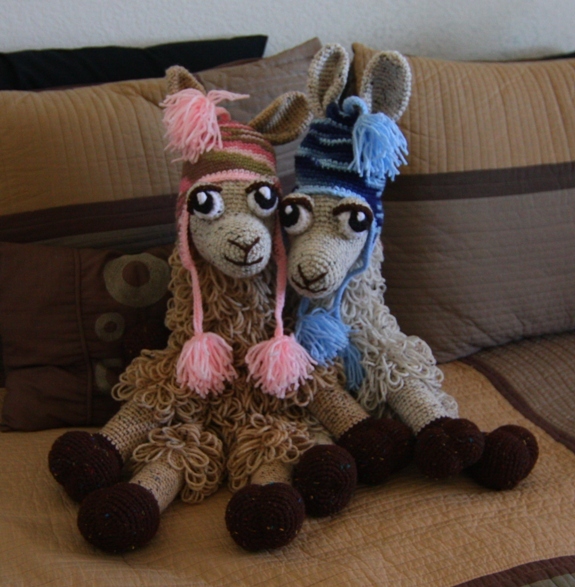 For the occasion I crocheted a llama and knitted a hat. Naturally I would need a card for the gift. I was going for simple, and this girl stamp from Little Yellow Bicycle (from the SWS 105 set) did the trick. The word is stamped in a pink. I used a glitter pen to trace the letters. The daisy is a button attached to the top layer. 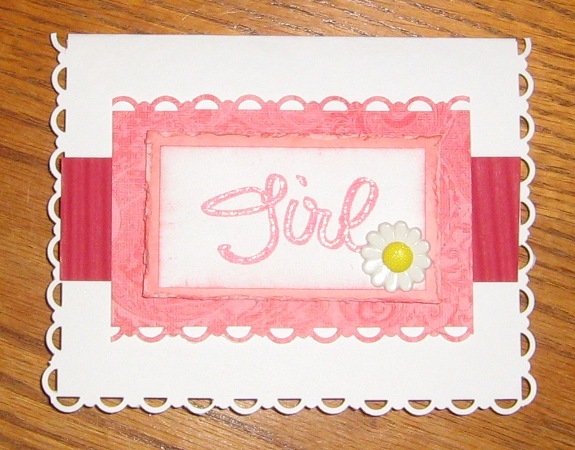 The word layer is taped to a pink paper that I distressed with scissors. 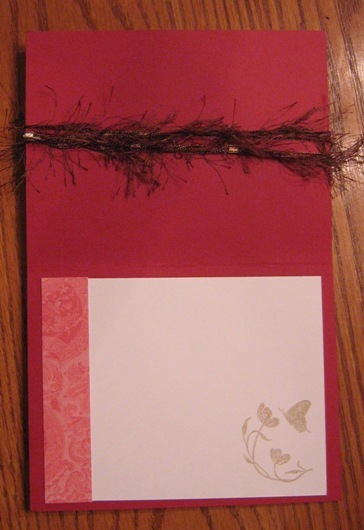 The decorated paper is red and pink. I used a decorative punch on two edges. The red strip on the bottom was crimped with a little crimping machine. 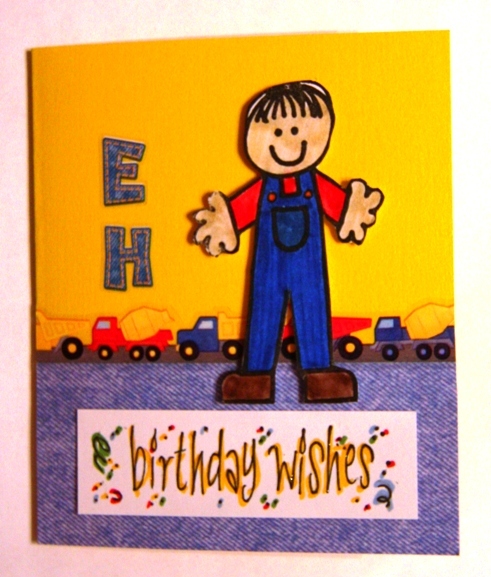 Because I thought it still lacked a little something, I punched the three edges of the card with the decorative punch. 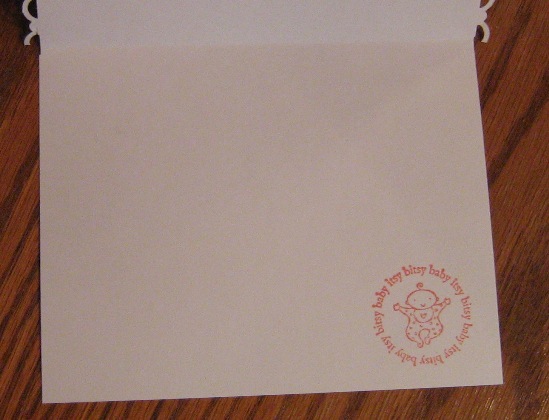 Inside I stamped Stampin’ Up’s “itsy bitsy baby” stamp in the same color as the front. I had to trip the edges of the bottom so they didn’t show through the decorative edge of the cover. Here is the llama and hat. She only got the llama with the pink hat. The one with the blue hat is for my nephew. Find out more about these from my knitting and crocheting blog. 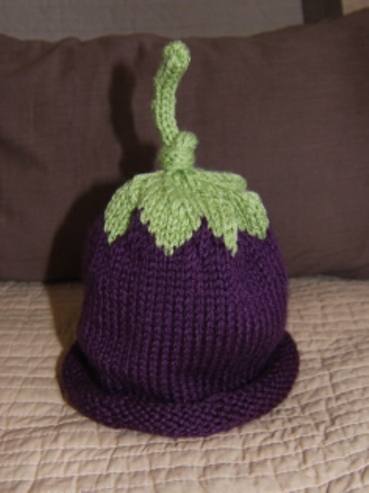 My husband calls the baby hat eggplant head. I didn’t have an acrylic block to fit the background stamp, so I used the wood side of the stamp to make the background section. 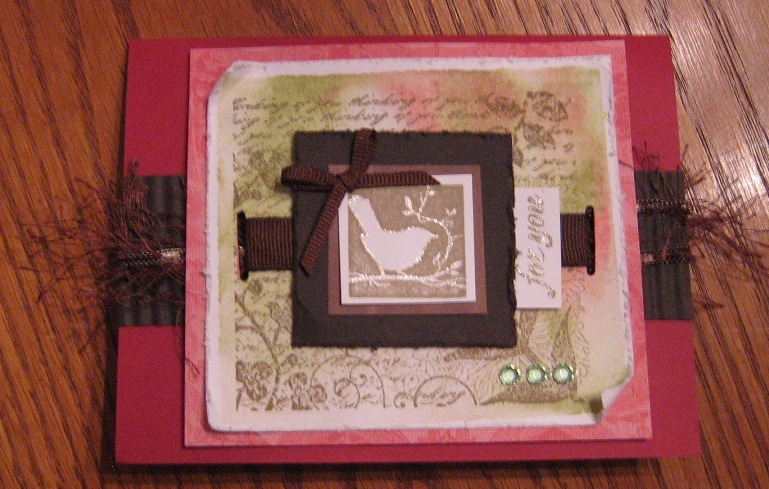 I covered the wood with the red distress ink (Tim Holtz/Ranger), then added little dabs of green. I sprayed the ink with a little water with a spritzer, then “stamped” the paper wood/ink side down. Pressing the stamp made the colors run together. I dried the paper with an embossing gun, and the dried portion looked like I had water colored it! I stamped the same stamp, only the rubber side with brown. I also stamped a bird and “for you”. The stamps were all from Stampin’ Up. I layered with red and textured paper. A few different ribbons, corrugated brown paper, and a few gems and the front was complete. 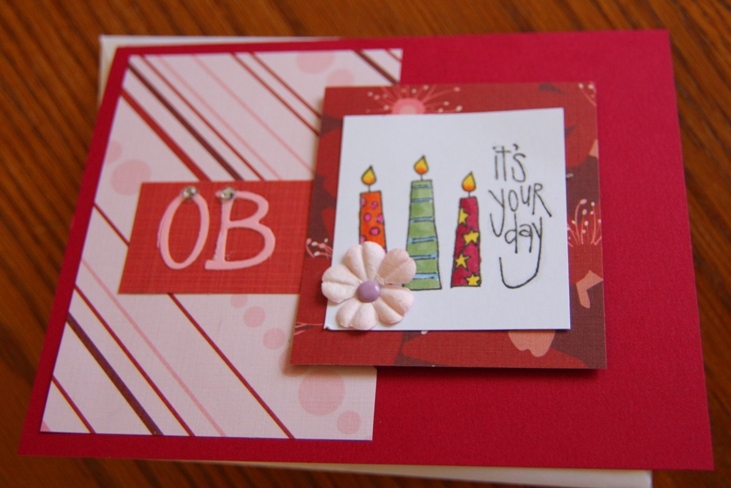 I added the textured paper and another stamp from Stampin’ Up to the inside. Mom thought the card was lovely, even though it had a lot of brown! My Japanese neighbor recently made a curry dinner for my husband and I to try – yum! I got right to making a thank you card for her. I am hoping in the future we can get together to make cards or do other crafts. My sister sent me a link to a video that showed how to create a “watercolored” effect with a stamp and distress ink. The background for the bamboo plants is done with that effect. 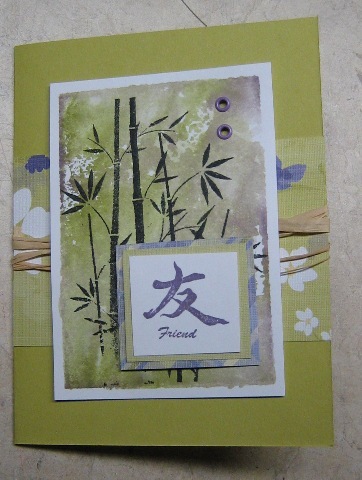 I stamped the wood side of the bamboo stamp with green, then added a little purple around the edges and center. After spraying it with a little water, I pressed it on the paper. I used the heat gun to dry it, then stamped the bamboo on top. I prefer doing the “watercolor” effect on a clear acrylic block. That way I can see if the ink has covered the whole area. As you can see, there are a couple of white spots on my card, which I couldn’t see because I used the wood. However, using the wood ensured that I would have an area similar in size to the stamped image. I stamped a little “friend” in purple, added purple gromits, some decorative paper and raffia and I was all done. 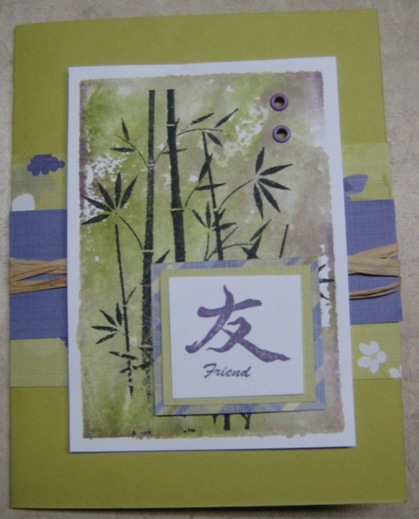 I stamped the inside with a circle bamboo stamp. I put it in the center because it reminds me of the Japanese flag! 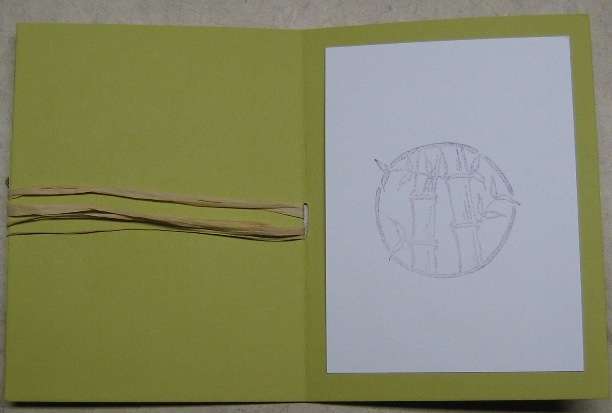 The bamboo plants stamp on the cover of the card is from Hero Arts. The “friend” stamp is from Inkadinkado. The circle bamboo stamp on the inside is from Hanko designs. 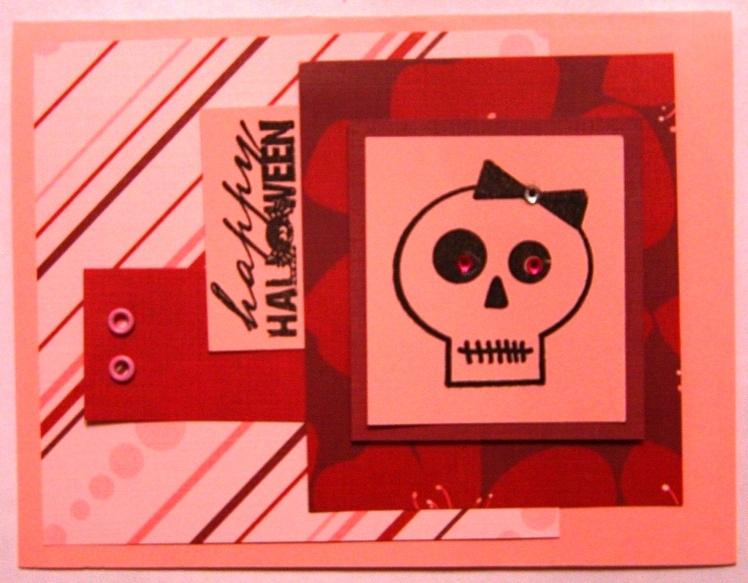 Ok, after thinking about it, I decided to add a purple strip of paper to the card. After reassembling it, I wondered about crinkling the purple, but I didn’t want to take it apart again, so I left it. I really wanted to add a strip of nice purple ribbon, but I didn’t have one thick enough.